"Finally, an Effective Method to Learn Calculus the Intuitive Way"
As I advanced in my mathematics carreer, I learned that most people have a misconception about math: to be good at math you need an inborn talent. This module deals with one of the three central concepts in calculus: derivatives. In this course we assume you already mastered limits, so it would be a good idea to first go through the first module (best deal? Get both!). This module will give you a deep understanding of derivatives. You can use it no matter at what level you are: high-school, college or self-studying. As a supplement to your lectures and textbook. If you are taking a calculus course this module is excelent as a supplement to the materials your teacher gives you. I'm sure you know that failure rate at calculus is usually higher than 50%. So, why take chances? Learn calculus the intuitive way and you'll surprise your teacher and classmates with your new skills! A deep intuitive understanding of derivatives. In my experience, this is achieved by very few students. This understanding sets appart notable students from average ones. In this module you'll develop this intuitive understanding with a method that never failed to this day (even with those students that considered themselves dumb at math). Complete mastery of problem-solving techniques for derivatives. After you developed a basic intuition of derivatives, we'll begin to solve problems that usually appear on calculus courses and tests (these problems will also help to strengthen your intuition). We may use techniques that are different from the ones you'd find on your textbook (you may even give your teacher a great surprise with your more efficient method of problem-solving). Some people tell me there are already too many calculus textbooks out there. That's true, but there's nothing like The Intuitive Calculus Course. That's because this is not a textbook. 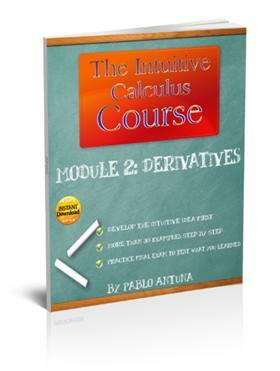 That's much more that triple of the cost of this module of the Intuitive Calculus Course. Also, consider the cost of your ordinary textbook. Most calculus textbooks cost more than 150$. They can be roughly divided into three sections: limits, derivatives and integrals. So, we can say that you are paying 50$ to learn about derivatives. To make this module accesible to almost everyone, I priced it only $19.75. For this price a tutor would teach you only about 20 minutes. Why such a low price for a 140-page ebook with the most effective method to learn derivatives in calculus?